The satisfactory performance of any modern aircraft depends to a very great degree on the continuing reliability of electrical systems and subsystems. Improperly or carelessly installed or maintained wiring can be a source of both immediate and potential danger. The continued proper performance of electrical systems depends on the knowledge and technique of the mechanic. Virtually all aircraft contain some form of an electrical system. The most basic aircraft must produce electricity for operation of the engine’s ignition system. Modern aircraft have complex electrical systems that control almost every aspect of flight. In general, electrical systems can be divided into different categories according to the function of the system. Common systems include lighting, engine starting, and power generation. Ohm’s Law provides a foundation of mathematical formulas that predict how electricity responds to certain conditions. 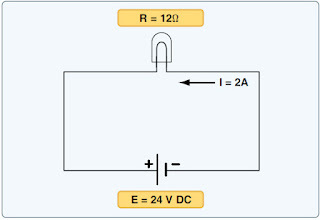 [Figure 1] For example, Ohm’s Law can be used to calculate that a lamp of 12 Ohms (Ω) passes a current of 2 amps when connected to a 24-volt direct current (DC) power source. A 28-volt landing light circuit has a lamp with 4 ohms of resistance. Calculate the total current of the circuit. A 28-volt deice boot circuit has a current of 6.5 amps.Calculate the resistance of the deice boot. A taxi light has a resistance of 4.9 Ω and a total current of 2.85 amps. Calculate the system voltage. Whenever troubleshooting aircraft electrical circuits, it is always valuable to consider Ohm’s Law. A good understanding of the relationship between resistance and current flow can help one determine if a circuit contains an open or a short. Remembering that a low resistance means increased current can help explain why circuit breakers pop or fuses blow. In almost all cases, aircraft loads are wired in parallel to each other; therefore, there is a constant voltage supplied to all loads and the current flow through a load is a function of that load’s resistance. 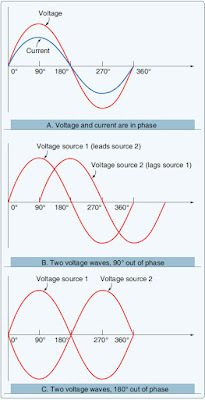 Figure 2 illustrates several ways of using Ohm’s Law for the calculation of current, voltage, and resistance. Electrical current is the movement of electrons. This electron movement is referred to as current, flow, or current flow. In practical terms, this movement of electrons must take place within a conductor (wire). Current is typically measured in amps. The symbol for current is I and the symbol for amps is A. The current flow is actually the movement of the free electrons found within conductors. Common conductors include copper, silver, aluminum, and gold. The term “free electron” describes a condition in some atoms where the outer electrons are loosely bound to their parent atom. These loosely bound electrons are easily motivated to move in a given direction when an external source, such as a battery, is applied to the circuit. These electrons are attracted to the positive terminal of the battery, while the negative terminal is the source of the electrons. So, the measure of current is actually the number of electrons moving through a conductor in a given amount of time. The internationally accepted unit for current is the ampere (A). One ampere (A) of current is equivalent to 1 coulomb (C) of charge passing through a conductor in 1 second. One coulomb of charge equals 6.28 × 1018 electrons. Obviously, the unit of amperes is a much more convenient term to use than coulombs. The unit of coulombs is simply too small to be practical. It can be seen that a ball introduced in one end of the tube, which represents the conductor, immediately causes a ball to be emitted at the opposite end of the tube. Thus, electric current can be viewed as instantaneous, even though it is the result of a relatively slow drift of electrons. There are two competing schools of thought regarding the flow of electricity. The two explanations are the conventional current theory and the electron theory. Both theories describe the movement of electrons through a conductor. They simply explain the direction current moves. 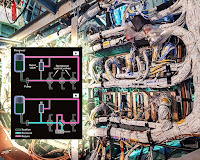 Typically during troubleshooting or the connection of electrical circuits, the use of either theory can be applied as long as it is used consistently. The conventional current theory was initially advanced by Benjamin Franklin, who reasoned that current flowed out of a positive source into a negative source or an area that lacked an abundance of charge. The notation assigned to the electric charges was positive (+) for the abundance of charge and negative (−) for a lack of charge. It then seemed natural to visualize the flow of current as being from the positive (+) to the negative (−). Later discoveries were made that proved that just the opposite is true. Electron theory describes what actually happens in the case of an abundance of electrons flowing out of the negative (−) source to an area that lacks electrons or the positive (+) source. Both conventional flow and electron flow are used in industry. The voltage at one point is 14 volts. The voltage at a second point in the circuit is 12.1 volts. To calculate the voltage drop, use the formula above to get a total voltage drop of 1.9 volts. Figure 4 illustrates the flow of electrons of electric current. Two interconnected water tanks demonstrate that when a difference of pressure exists between the two tanks, water flows until the two tanks are equalized. Figure 4 shows the level of water in tank A to be at a higher level, reading 10 pounds per square inch (psi) (higher potential energy), than the water level in tank B, reading 2 psi (lower potential energy). Between the two tanks, there is 8 psi potential difference. If the valve in the interconnecting line between the tanks is opened, water flows from tank A into tank B until the level of water (potential energy) of both tanks is equalized. It is important to note that it was not the pressure in tank A that caused the water to flow; rather, it was the difference in pressure between tank A and tank B that caused the flow. This comparison illustrates the principle that electrons move, when a path is available, from a point of excess electrons (higher potential energy) to a point deficient in electrons (lower potential energy). The force that causes this movement is the potential difference in electrical energy between the two points. This force is called the electrical pressure (voltage), the potential difference, or the electromotive force (electron moving force). The two fundamental properties of current and voltage are related by a third property known as resistance. In any electrical circuit, when voltage is applied to it, a current results. 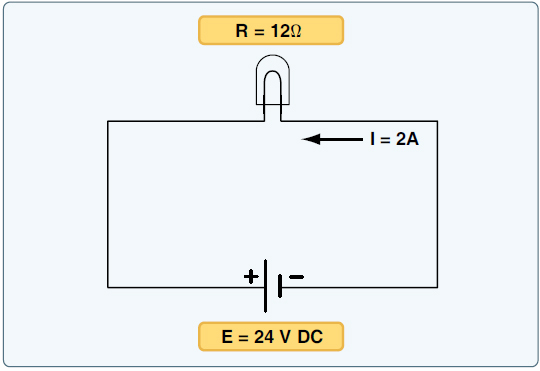 The resistance of the conductor determines the amount of current that flows under the given voltage. In general, the greater the circuit resistance, the less the current. If the resistance is reduced, then the current will increase. This relation is linear in nature and is known as Ohm’s Law. An example would be if the resistance of a circuit is doubled, and the voltage is held constant, then the current through the resistor is cut in half. There is no distinct dividing line between conductors and insulators; under the proper conditions, all types of material conduct some current. Materials offering a resistance to current flow midway between the best conductors and the poorest conductors (insulators) are sometimes referred to as semiconductors and find their greatest application in the field of transistors. The best conductors are materials, chiefly metals, that possess a large number of free electrons. Conversely, insulators are materials having few free electrons. The best conductors are silver, copper, gold, and aluminum, but some nonmetals, such as carbon and water, can be used as conductors. Materials such as rubber, glass, ceramics, and plastics are such poor conductors that they are usually used as insulators. The current flow in some of these materials is so low that it is usually considered zero. The resistance of a metallic conductor is dependent on the type of conductor material. It has been pointed out that certain metals are commonly used as conductors because of the large number of free electrons in their outer orbits. Copper is usually considered the best available conductor material, since a copper wire of a particular diameter offers a lower resistance to current flow than an aluminum wire of the same diameter. However, aluminum is much lighter than copper, and for this reason, as well as cost considerations, aluminum is often used when the weight factor is important. The resistance of a metallic conductor is directly proportional to its length. The longer the length of a given size of wire, the greater the resistance. Figure 5 shows two wire conductors of different lengths. 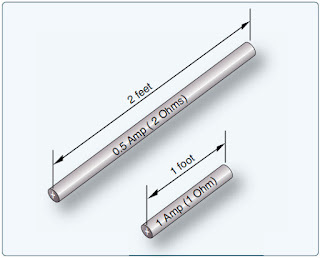 If 1 volt of electrical pressure is applied across the two ends of the conductor that is 1 foot in length and the resistance to the movement of free electrons is assumed to be 1 ohm, the current flow is limited to 1 ampere. If the same size conductor is doubled in length, the same electrons set in motion by the 1 volt applied now find twice the resistance. Electrical energy can be produced through a number of methods. Common methods include the use of light, pressure, heat, chemical, and electromagnetic induction. Of these processes, electromagnetic induction is most responsible for the generation of the majority of the electrical power used by humans. Virtually all mechanical devices (generators and alternators) that produce electrical power employ the process of electromagnetic induction. The use of light, pressure, heat, and chemical sources for electrical power is found on aircraft but produce a minimal amount of all the electrical power consumed during a typical flight. In brief, light can produce electricity using a solar cell (photovoltaic cell). These cells contain a certain chemical that converts light energy into voltage/current. Using pressure to generate electrical power is commonly known as the piezoelectric effect. The piezoelectric effect (piezo or piez taken from Greek: to press; pressure; to squeeze) is a result of the application of mechanical pressure on a dielectric or nonconducting crystal. Chemical energy can be converted into electricity, most commonly in the form of a battery. A primary battery produces electricity using two different metals in a chemical solution like alkaline electrolyte. A chemical reaction exists between the metals which frees more electrons in one metal than in the other. Heat used to produce electricity creates the thermoelectric effect. When a device called a thermocouple is subjected to heat, a voltage is produced. A thermocouple is a junction between two different metals that produces a voltage related to a temperature difference. If the thermocouple is connected to a complete circuit, a current also flows. Thermocouples are often found on aircraft as part of a temperature monitoring system, such as a cylinder head temperature gauge. Electromagnetic induction is the process of producing a voltage (EMF) by moving a magnetic field in relationship to a conductor. 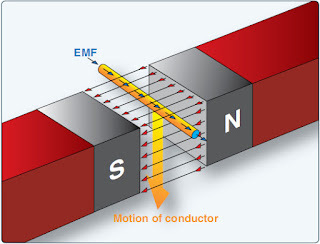 As shown in Figure 6, when a conductor (wire) is moved through a magnetic field, an EMF is produced in the conductor. If a complete circuit is connected to the conductor, the voltage also produces a current flow. One single conductor does not produce significant voltage/current via electromagnetic induction. 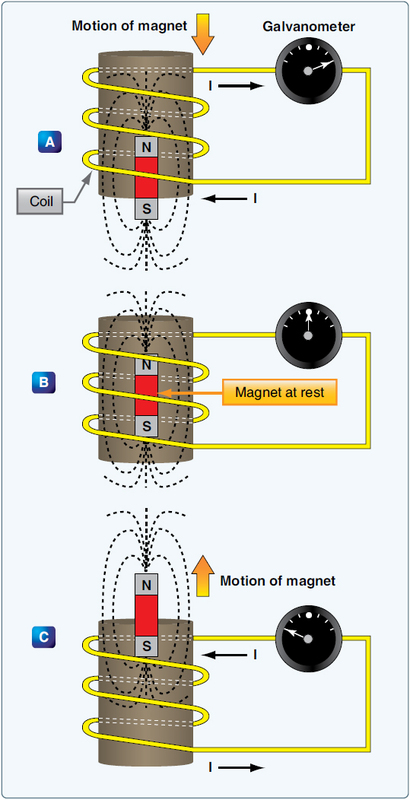 [Figure 6] In practice, instead of a single wire, a coil of wire is moved through the magnetic field of a strong magnet. This produces a greater electrical output. In many cases, the magnetic field is created by using a powerful electromagnet. This allows for the production of a greater voltage/current due to the stronger magnetic field produced by the electromagnet when compared to an ordinary magnet. It is the relative motion between a conductor and a magnetic field that causes current to flow in the conductor. Either the conductor or magnet can be moving or stationary. 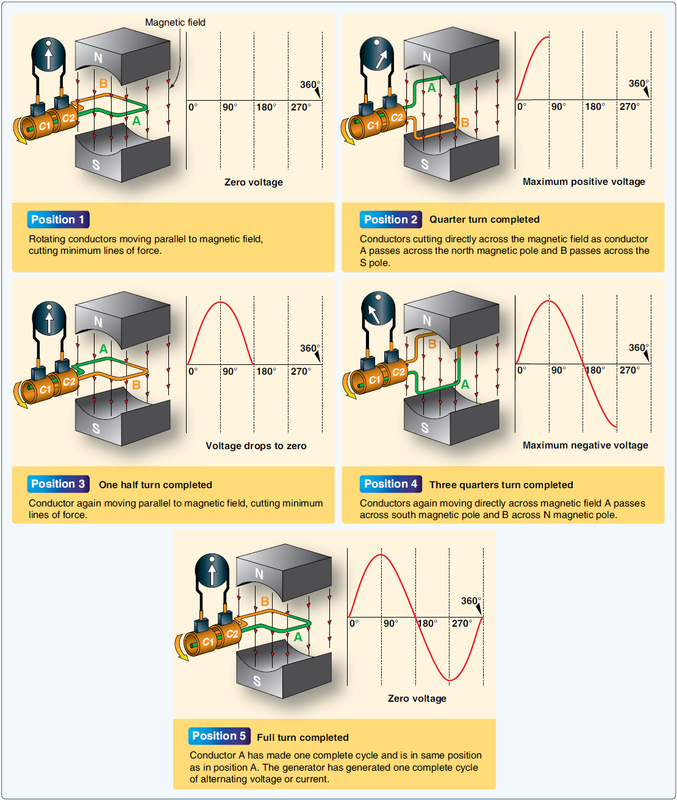 When a magnet and its field are moved through a coiled conductor, as shown in Figure 7, a DC voltage with a specific polarity is produced. The polarity of this voltage depends on the direction in which the magnet is moved and the position of the north and south poles of the magnetic field. 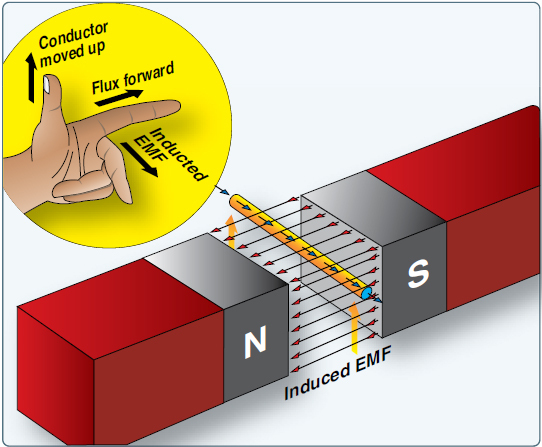 The generator left-hand rule can be used to determine the direction of current flow within the conductor. [Figure 8] Of course, the direction of current flow is a function of the polarity of the voltage induced in to the conductor. In practice, producing voltage/current using the process of electromagnetic induction requires a rotating machine. Generally speaking, on all aircraft, a generator or alternator employs the principles of electromagnetic induction to create electrical power for the aircraft. Either the magnetic field can rotate or the conductor can rotate. [Figure 9] The rotating component is driven by a mechanical device, such as an aircraft engine. Figure 10 illustrates the basics of a rotating machine used to produce voltage. 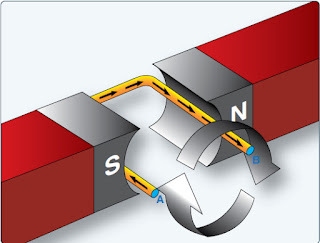 The simple generating device consists of a rotating loop, marked A and B, placed between two magnetic poles, N and S. The ends of the loop are connected to two metal slip rings (collector rings), C1 and C2. Current is taken from the collector rings by brushes. If the loop is considered as separate wires, A and B, and the left-hand rule for generators is applied, then it can be observed that as wire B moves up across the field, a voltage is induced that causes the current to flow towards the reader. As wire A moves down across the field, a voltage is induced that causes the current to flow away from the reader. When the wires are formed into a loop, the voltages induced in the two sides of the loop are combined. Therefore, for explanatory purposes, the action of either conductor, A or B, while rotating in the magnetic field is similar to the action of the loop. 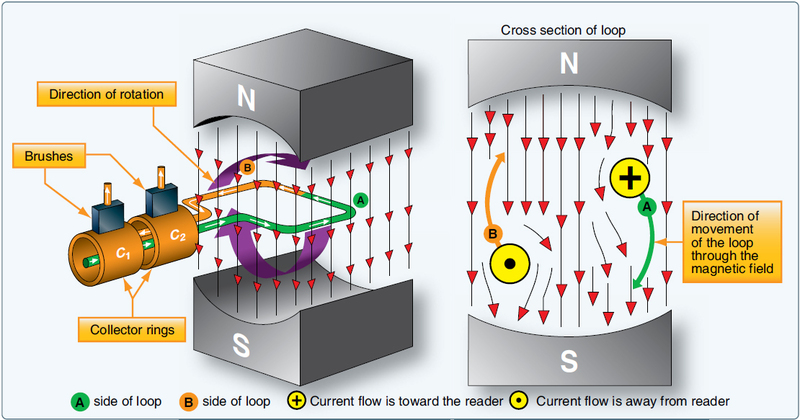 Figure 11 illustrates the generation of alternating current (AC) with a simple loop conductor rotating in a magnetic field. As it is rotated in a counterclockwise direction, varying voltages are induced in the conductive loop. The conductor A moves parallel to the lines of force. Since it cuts no lines of force, the induced voltage is zero. As the conductor advances from position 1 to position 2, the induced voltage gradually increases. The conductor is now moving in a direction perpendicular to the flux and cuts a maximum number of lines of force; therefore, a maximum voltage is induced. As the conductor moves beyond position 2, it cuts a decreasing amount of flux, and the induced voltage decreases. At this point, the conductor has made half a revolution and again moves parallel to the lines of force, and no voltage is induced in the conductor. As the A conductor passes position 3, the direction of induced voltage now reverses since the A conductor is moving downward, cutting flux in the opposite direction. As the A conductor moves across the south pole, the induced voltage gradually increases in a negative direction until it reaches position 4. Like position 2, the conductor is again moving perpendicular to the flux and generates a maximum negative voltage. From position 4 to position 5, the induced voltage gradually decreases until the voltage is zero, and the conductor and wave are ready to start another cycle. The curve shown at position 5 is called a sine wave. It represents the polarity and the magnitude of the instantaneous values of the voltages generated. The horizontal baseline is divided into degrees, or time, and the vertical distance above or below the baseline represents the value of voltage at each particular point in the rotation of the loop. The specific operating principles of both alternators and generators as they apply to aircraft is presented later in this text. Alternating current (AC) electrical systems are found on most multi-engine, high performance turbine powered aircraft and transport category aircraft. AC is the same type of electricity used in industry and to power our homes. Direct current (DC) is used on systems that must be compatible with battery power, such as on light aircraft and automobiles. There are many benefits of AC power when selected over DC power for aircraft electrical systems. AC can be transmitted over long distances more readily and more economically than DC, since AC voltages can be increased or decreased by means of transformers. Because more and more units are being operated electrically in airplanes, the power requirements are such that a number of advantages can be realized by using AC (especially with large transport category aircraft). Space and weight can be saved since AC devices, especially motors, are smaller and simpler than DC devices. In most AC motors, no brushes are required, and they require less maintenance than DC motors. Circuit breakers operate satisfactorily under loads at high altitudes in an AC system, whereas arcing is so excessive on DC systems that circuit breakers must be replaced frequently. Finally, most airplanes using a 24-volt DC system have special equipment that requires a certain amount of 400 cycle AC current. For these aircraft, a unit called an inverter is used to change DC to AC. Inverters are discussed later in this book. AC is constantly changing in value and polarity, or as the name implies, alternating. 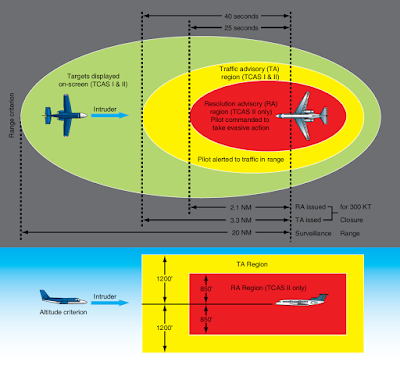 Figure 12 shows a graphic comparison of DC and AC. The polarity of DC never changes, and the polarity and voltage constantly change in AC. It should also be noted that the AC cycle repeats at given intervals. With AC, both voltage and current start at zero, increase, reach a peak, then decrease and reverse polarity. If one is to graph this concept, it becomes easy to see the alternating wave form. This wave form is typically referred to as a sine wave. 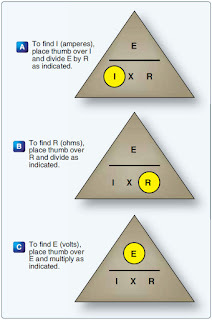 There are three values of AC that apply to both voltage and current. These values help to define the sine wave and are called instantaneous, peak, and effective. It should be noted that during the discussion of these terms, the text refers to voltage. But remember, the values apply to voltage and current in all AC circuits. An instantaneous voltage is the value at any instant in time along the AC wave. The sine wave represents a series of these values. The instantaneous value of the voltage varies from zero at 0° to maximum at 90°, back to zero at 180°, to maximum in the opposite direction at 270°, and to zero again at 360°. Any point on the sine wave is considered the instantaneous value of voltage. 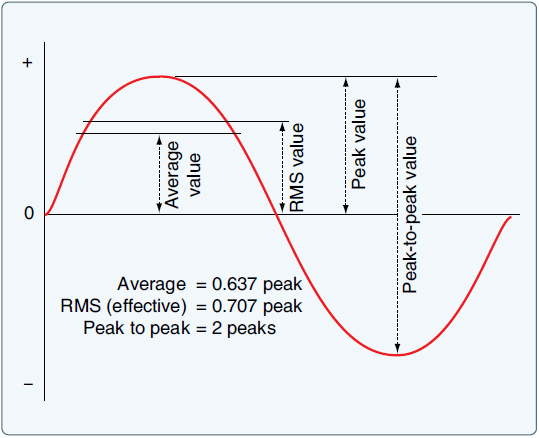 The peak value is the largest instantaneous value, often referred to as the maximum value. The largest single positive value occurs after a certain period of time when the sine wave reaches 90°, and the largest single negative value occurs when the wave reaches 270°. 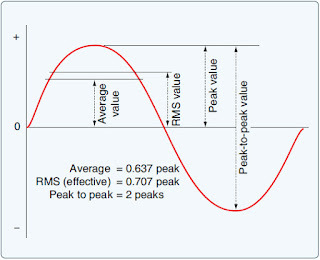 Although important in the understanding of the AC sine wave, peak values are seldom used by aircraft technicians. The effective values for voltage are always less than the peak (maximum) values of the sine wave and approximate DC voltage of the same value. For example, an AC circuit of 24 volts and 2 amps should produce the same heat through a resistor as a DC circuit of 24 volts and 2 amps. The effective value is also known as the root mean square, or RMS value, which refers to the mathematical process by which the value is derived. Most AC meters display the effective value of the AC. In almost all cases, the voltage and current ratings of a system or component are given in effective values. In other words, the industry ratings are based on effective values. Peak and instantaneous values, used only in very limited situations, would be stated as such. In the study of AC, any values given for current or voltage are assumed to be effective values unless otherwise specified. In practice, only the effective values of voltage and current are used. The effective value is equal to .707 times the peak (maximum) value. Conversely, the peak value is 1.41 times the effective value. Thus, the 110 volt value given for AC is only 0.707 of the peak voltage of this supply. The maximum voltage is approximately 155 volts (110 × 1.41 = 155 volts maximum). A cycle is a completion of a pattern. Whenever a voltage or current passes through a series of changes, returns to the starting point, and then repeats the same series of changes, the series is called a cycle. 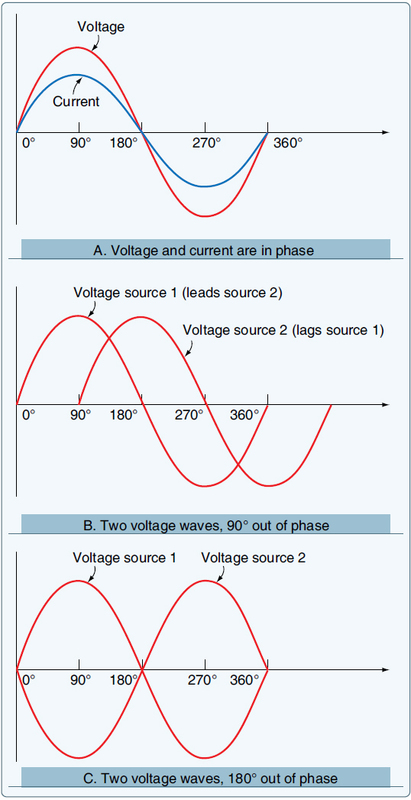 When the voltage values are graphed, as in Figure 14, the complete AC cycle is displayed. One complete cycle is often referred to as the sine wave and said to be 360°. It is typical to start the sine wave where the voltage is zero. The voltage then increases to a maximum positive value, decreases to a value of zero, then increases to a maximum negative value, and again decreases to zero. The cycle repeats until the voltage is no longer available. There are two alternations in a complete cycle: the positive alternation and the negative. It should be noted that the polarity of the voltage reverses for each half cycle. 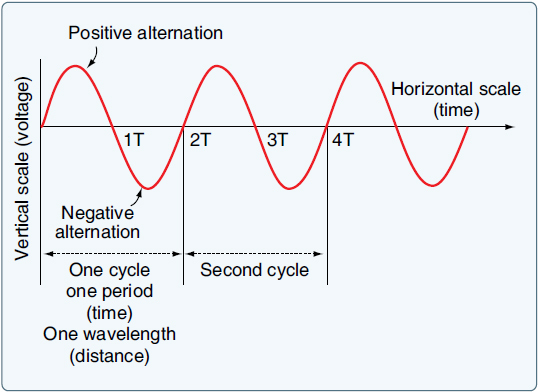 Therefore, during the positive half cycle, the electron flow is considered to be in one direction; during the negative half cycle, the electrons reverse direction and flow the opposite way through the circuit. 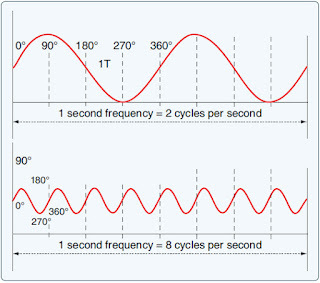 The frequency is the number of cycles of AC per second (CPS). The standard unit of frequency measurement is the Hz. 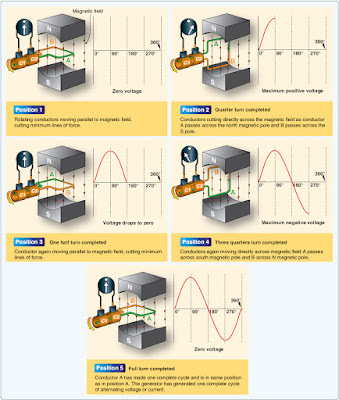 [Figure 15] In a generator, the voltage and current pass through a complete cycle of values each time a coil or conductor passes under a north and south pole of the magnet. The number of cycles for each revolution of the coil or conductor is equal to the number of pairs of poles. The frequency, then, is equal to the number of cycles in one revolution multiplied by the number of revolutions per second. 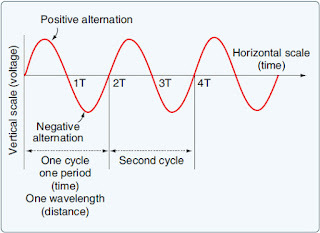 The higher the frequency is, the shorter the wavelength is The measurement of wavelength is taken from one point on the waveform to a corresponding point on the next waveform. [Figure 14] Since wavelength is a distance, common units of measure include meters, centimeters, millimeters, or nanometers. For example, a sound wave of frequency 20 Hz would have wavelength of 17 meters and a visible red light wave of 4.3 × 10 –12 Hz would have a wavelength of roughly 700 nanometers. Keep in mind that the actual wavelength depends on the media through which the waveform must travel. 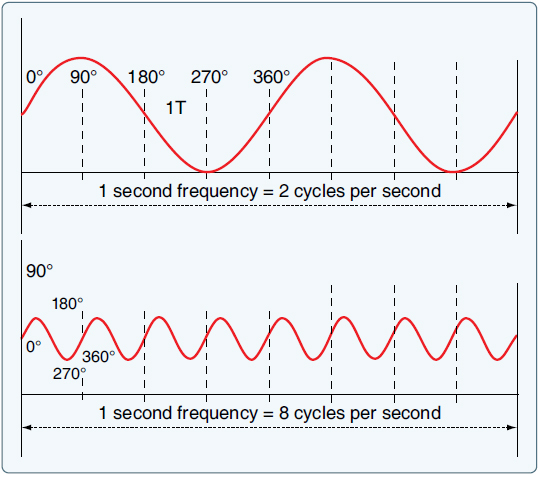 Phase is the relationship between two sine waves, typically measured in angular degrees. For example, if there are two different alternators producing power, it would be easy to compare their individual sine waves and determine their phase relationship. In Figure 16B, there is a 90° phase difference between the two voltage waveforms. A phase relationship can be between any two sine waves. The phase relationship can be measured between two voltages of different alternators or the current and voltage produced by the same alternator. Figure 16A shows a voltage signal and a current signal superimposed on the same time axis. Notice that when the voltage increases in the positive alternation that the current also increases. When the voltage reaches its peak value, so does the current. Both waveforms then reverse and decrease back to a zero magnitude, then proceed in the same manner in the negative direction as they did in the positive direction. When two waves are exactly in step with each other, they are said to be in phase. To be in phase, the two waveforms must go through their maximum and minimum points at the same time and in the same direction.